Hiked and enjoyed the scenery in the Colorado Rockies. Welcome to sunny South Florida. I hope you enjoy your visit to my page. As soon as I figure out how, I will post a photo. Happy fun loving boys. One seems to be proudly showing his missing teeth. Trade you some gentle rain theyd love to play in for some of your warmth. Lovely photo of your son's and their dogs. I will leave you one of my pink camelias as a welcome to you new home page. I have not visited Florida. Hi, Tami! to your new page. I'm impressed - you already have a picture of some great-looking boys here on your page. As you continue to settle in, please enjoy these tulips and a big box of Frango Mints. Of course, the dogs are also quite handsome! Just dropping in some bubbly for sharing with all your guests!! Congrats on getting your place decorated so quickly! Julie, Thanks for the Frango Mints. They are my FAVORITES. I am glad Macy's carries them now. Now I don't have to wait for a friend to go to Chicago. The tulips are beautiful. The bigger dog is the only other girl in my house. Come visit anytime. Bluey, Thanks for the bubbly. Hope you are enjoying your visit. Congratulations to have Your own page and very glad to see Your kids on top of the page. Tami with my best wishes to You I offer You this nice . You are to my Egyptian Guest House any and every time You Wish. Tami, thank you for the compliment you left on my page - that's the nicest thing anyone has said for a long time. I am lucky enough to have travelled a bit and I enjoy sharing my travels with others. Hi Tami; It seems we are (almost) neighbors. I live in Miami and just absolutely LOVE the Everglades. I try to go almost every weekend. Unfortunately with all the smoke we are having I did not go today. I hope we get some rain soon! Best regards and a very Happy Mothers Day to you. Your sons are so cute! Tami, have you been in touch with nal from Miami? She is a great photographer and, as far as I can tell, she lives in your neck of the woods. Have a look at nal's flickr page and it might inspire you and give you some ideas. Hope you are having a wonderful Mothers Day. Hi Tami, are you still having trouble with flickr? If so, just sign out and then sign in again and you will see something like 'Upload your Photos' among the options. If you click on that you will be able to upload up to six photos. Do let me know if you are still having difficulties. Tami, thanks for your response. I wish you well with your pooter, they can be dreadfully confusing at times. I'm sure there are little people who live in computers whose sole job is to confuse us. I can imagine that marking papers would be a bit of a pain in the neck, but I guess it goes with the territory. Tami, it looks like you have succeeded. Congratunations. They are great photos of your family. Hi Tami! Thanks for the very fresh orange juice, I always associate Florida with oranges I live about 30 miles from Dumfries, it is our nearest 'proper' town. There are 2 others about 15 miles away, Lockerbie (SW) and Langholm (SE) they not 'improper' (!) just more like big villages. Dumfries has the chain stores and a cinema!!! WOW!!! I think we have each invented new words - my congratunations and your ocmputer! Tami, I have already invented another - clarefully. And so life goes on - lurching from one typo to another. I'll have to be more clareful in fluture. Hello Tami ,thank you for the juice ,any time is good for more ,you have lovely boys ,i have three also .come back to visit . Good Afternoon Tami. Sorry for the mi-identification of your boys. My second one has always been bigger than his brother--certainly never wore hand-me-downs! Even at 27 ans 28, Jake is over 6 feet tall, while Craig is about 5'6'. Funny, their pants legs are pretty close to the same! Hope you have a wonderful day, and a great week to follow. Hi, Tami! I'm pasting my recipe for Farfalle with Smoked Salmon, Capers and Dill below. (I hope this works. If not, let me know, and I'll type it in) Enjoy!!! Hi Tami, and welcome to your own page! I'm slow in visiting, but I'll still keave a page warming gift of FOUR double chocolate fudge beavertail pastries from Ottawa for you and your three handsome men! Hope everyone like sweet pastry! Enjoy! Hi Tami, thank you so much for the orange juice it was very refreshing. Your two boys look full of fun and probably mischief. My youngest daughter has just made a lovely Lemon meringue pie for me to leave for you, hope you enjoy it. Hi Tami. for the fresh-squeezed orange juice - SO much better than the frozen stuff. Love the pic of your family - I bet they're a handful! Hi Tami, thanks for your comment on the 'Medium' sukudo this morning. I hate to confess it, but that photo was taken at a local wildlife park. The koalas are not very common in the wild and yes, it is a great thrill when you see one. Hi Tami, I do hope you enjoy your trip to Colorado. It is a great State, full of unexpected delights. If you can, do pay a visit to the Rocky Mountains National Park while you are there, it is a place of staggering beauty. 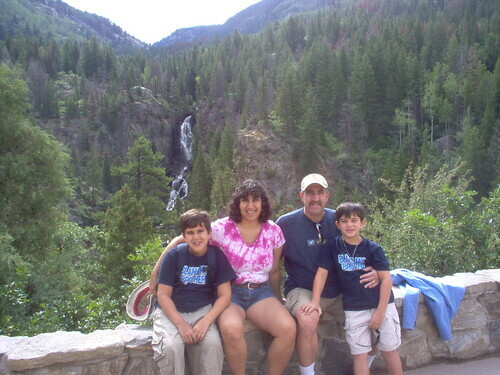 Tami, as you probably know, Estes Park is close to the entrance of the Rocky Mountains National Park. It is where one of my American cousins has a holiday cabin. We were lucky enough to stay there a few years ago during one of our visits to USA. Hello T A M I.
Verey pleased to your visit with your lovely son to my page 'Egyptian Guest House' and your interest about my photos. Hope to see You again but my response will be from Los angles as I fly within 24 hours to visit my son and his faimly .See You.